One of the most commonly reported problems with garage doors is broken cables. Each year we are called by literally hundreds of homeowners whose garage doors won’t work because of a damaged cable or a similar issue. 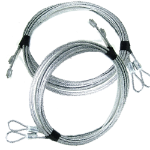 The garage door cable works in concert with the associated torsion springs. If you look closely, its hard to miss the cable drums located on both ends of the related axle where the springs are mounted. The springs run from the roller brackets located on the bottom corners of the garage door and connect to the drums. When the garage door is raised the springs will unwind, allowing it to lift the door. During this time the cable will wrap around the cable drum. The cable is then unwound when the door is lowered, and the springs are under full tension. So, if the cable breaks or gets stuck it is evident that the garage door will not open or close. We know that garage door cable issues can be frustrating and our Garage Door Cable Repair Service is meant to eliminate that frustration. Our team of technicians will fix the problem in the shortest time possible, not only that but they will make sure you don’t face the same problem anytime soon. We understand that a broken cable can ruin your entire day. It can cause you to get late for work, and that can make you feel stranded. However, regardless of how tempting it may be to try and fix the problem yourself the risk isn’t worth it. There is a real danger trying to repair or replace high-torsion springs and related parts; the slightest mistake can cause personal and property damage. The best thing to do is to call us right away. If anything, we have the expertise and workforce to fix the problem in no time. Plus, you’re not putting yourself or property at risk. Our garage door cable repair service you’ll never be left out in the heat, rain, or cold. We are an industry-leading company with years of experience in fixing and replacing garage door cables. Our technicians work swiftly, professionally, responsibly and safely. So, your door will be up and running in no time. The one thing worth considering is that garage doors are very heavy, and so they can be difficult to operate when the cables are damaged. It is for this reason that you shouldn’t continue using the garage door if it exhibits signs of wear or potential damage. Get it professionally inspected to avoid frustrating instances of a broken cable when you’re in a hurry. That said a garage door cable cost isn’t much but the frustration and loss of time associated with its failure isn’t worth it. So, don’t put off preventive maintenance until it is too late. Also, never attempt to fix a problem yourself. Call Elite Garage Door Repair and Installation today to ensure professional repairs.